This is NASA's science vision: using the vantage point of space to achieve with the science community and our partners a deep scientific understanding of our planet, other planets and solar system bodies, the interplanetary environment, the Sun and its effects on the solar system, and the universe beyond. In so doing, we lay the intellectual foundation for the robotic and human expeditions of the future while meeting today's needs for scientific information to address national concerns, such as climate change and space weather. At every step we share the journey of scientific exploration with the public and partner with others to substantially improve science, technology, engineering and mathematics (STEM) education nationwide. SMD organizes its work into four broad scientific pursuits: Earth Science, Planetary Science, Heliophysics and Astrophysics. Each of these pursuits is managed by a Division within the Directorate, each having its own science sub-goals. Resources Management: Formulate, advocate, and implement the SMD budget for the Directorate. Strategic Integration & Management: Provide policy support and conduct business operations for the Directorate. 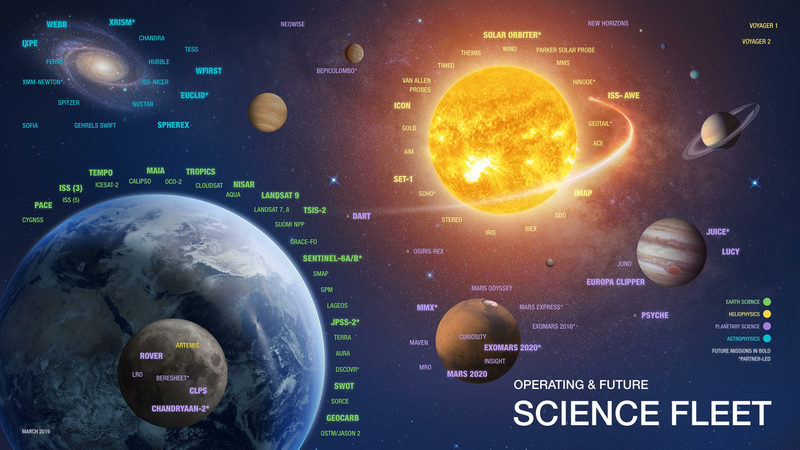 Fundamental research on profound science questions using space-based observatories and related assets is the hallmark of all four areas of NASA's SMD. Astrophysics pursues answers to questions about the universe that are as old as humanity. Heliophysics and Planetary Science both include elements important to the success of NASA's human exploration endeavors, and the former has practical utility on Earth. Earth Science is inherently beneficial to society in practical ways and requires that means be created to transfer its results for use in decision support and policy making. Research in all four science areas is essential to the fulfillment of national priorities embodied in Presidential initiatives and Congressional legislation, and scientific priorities identified by the nations' scientific community.